Sunday, April 28, 1-5 PM on Court & Cayuga Sts. Streets Alive! 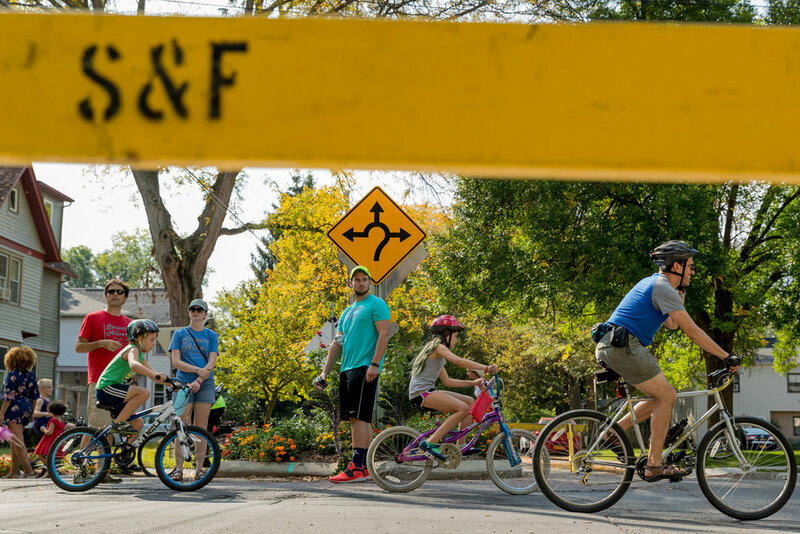 Ithaca is a wonderful event and it takes 100+ volunteers to make it a reality, particularly to help close the streets to cars and encourage people to have fun. From Intersection Superheroes to Photographers and Roving Bike Mechanics, we have a place for you. Volunteers age 16+ from across the community are invited to join our team! An awesome free t-shirt, snacks, and great community fun are included. Anyone can host an informal activity as the streets are open to all, no registration required. However, if you plan to do something bigger than “lemonade stand” level, or if you are a formal organization or group, please read our simple guidelines and complete our activities signup. On the day of Streets Alive!, parking will not be allowed along the route according to posted signage to minimize danger to people who are expecting no cars along the route. Parking is available on nearby streets, and we warmly invite you to participate in the festivities! Can’t wait for Streets Alive!? Get a monthly dose of inspiration, news, and calls to action from Bike Walk Tompkins. Read past e-newsletters and add your email to our mailing list so you don't miss out. We respect your privacy and will never sell or share your information with people outside of Bike Walk Tompkins and the Center for Community Transportation. Thank you for signing up for the Bike Walk Tompkins e-news. You are all set to receive the next issue of our e-news. While you're waiting, we welcome you to read past e-newsletters to catch up!